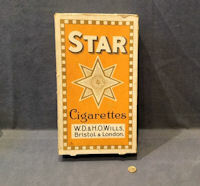 Original, quality 1920's / 30's shop cardboard dummy display cigarette packet of huge proportions detailing "WD & H.O Wills Bristol & London", "Star Cigarettes" to the front and back "10 Cigarettes" to one side and "This label is Issued by The Imperial Tobacco Co ( of Great Britain & Ireland ) Limited". Some scruffy edges and some paper repair gummed tape used inside to support weak edges and folds, otherwise complete and in good order. 15" x 8.5" x 4". 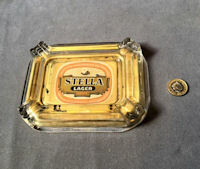 Original, quality 1920's/30's moulded glass ashtray with four corner cigarette rests and an advert to the base detailing "Stella Lager". Some wear to the protective paint to the underside otherwise complete and in good order. 6.5" x 5" x 1". 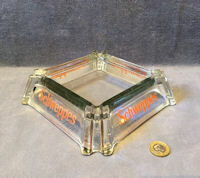 Original, quality 1950's moulded clear glass large counter top ashtray with four corner cigarette slots and red text to each side detailing "Schweppes". Complete and in good and working order. 7.5" square and 2" tall. Original, quality 1920's /30's circular bakelite ashtray with three cigarette rests and embossed letters detailing "Burgoyne's Empire Wines". Cleaned and waxed, in super condition and complete. 4.5" base diam and 0.75" tall. 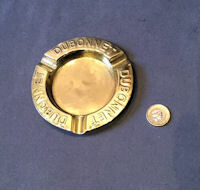 Original, quality 1920's circular pressed brass ashtray with three cigarette rests and embossed 'Dubonnet' in upper cased text to the rim. Polished and lacquered, although the lacquer may be removed at no extra cost and complete and in good order. 4.25" diam and 0.5" front to back. 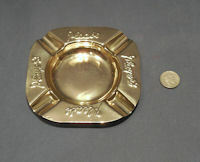 Original, quality 1920's pressed brass square ashtray impressed "D&J Mc Callum's Perfection Scotch Whisky". This example has four cigarette grooves and has been polished and lacquered to the upper surface and waxed to the underside. Complete and in order. 5 1/8" x 5 1/8" and 0.5". Original, quality 1920's square shaped copper ashtray in a hammered finish and Arts and Crafts style. The reverse is impressed with the Staffordshire knot logo and name for the manufacturer 'Perry Son and Co' and the registration number for the year 1890. Polished and lacquered and complete and in good order. 5.5" square and 0.5" tall. 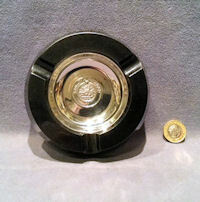 Original, quality 1920's unused circular bakelite ashtray with three cigarette rests and a nickel plated mount to the centre detailing "King of the Road" and the Lucas Lion logo. 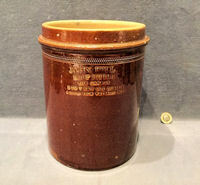 The underside is embossed "Moulded in our own works". This super example really is in mint condition and complete and in good order. 4.75" diam x 1". 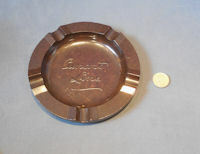 Original, quality all nickel ashtray issued between 1910 to 1913 by the Automobile Association. This example has the badge of the day engraved to both sides "Telephone Mayfair 1430" and "Telegrams Fanum London". Polished and lacquered, although the lacquer may be removed at no extra cost and complete and in good order. 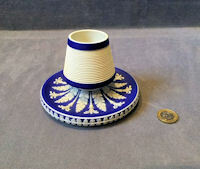 4" tall and 4" diam base. 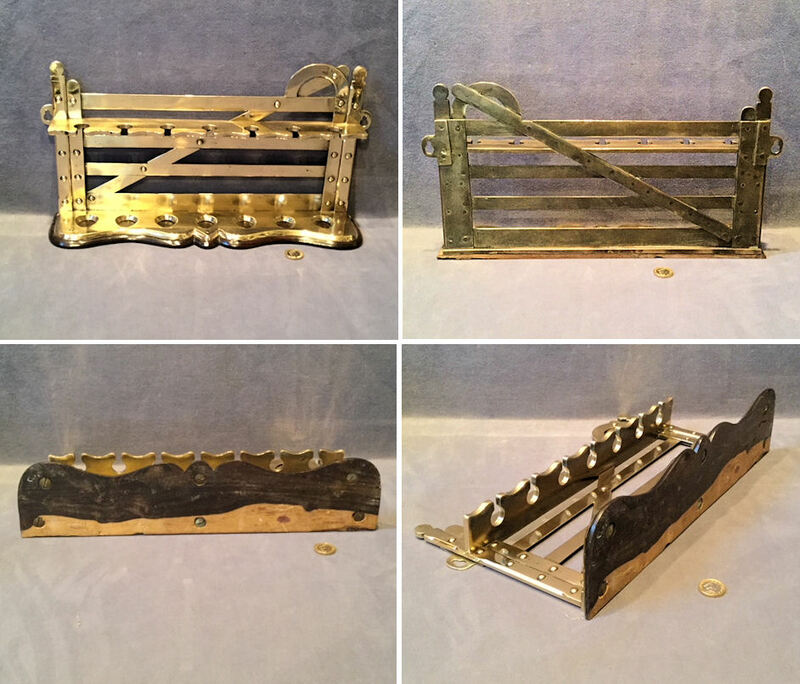 Original, quality pre-war unused brass cinema ashtrays originally fitted on the rear of the seat top rail for the use of the people behind. This superb find still has the remains of the original brown wrapping paper and all the original bronzed finish. The backplate has two holes for mounting, the front of the bowl has ribs for striking the match and the reverse is stamped 'Nestor' for the manufacturer and "Made in England". Complete and in good and working order. 3.75" x 1.5" tall and 1.75" front to back. Price is for each. Original, quality 1920's / 30's, pressed sheet brass ashtray with four cigarette rests and "Players Please" embossed to the top. Polished and lacquered, although the lacquer may be removed at no extra cost. Complete and in good order. 5" square x 0.5" front to back. Price is for each. Original, quality 1920's, circular brown bakelite ashtray with five original cigarette resting points and embossed to the centre "Cunard Line" for the shipping company. The reverse is embossed for the manufacturer "Fraser and Glass Ltd London N12" and "British Made". 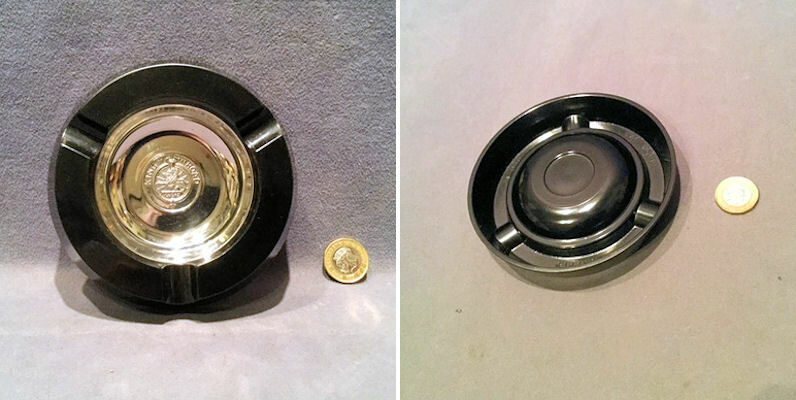 A small chip under the outer rim, otherwise complete and in good and working order. 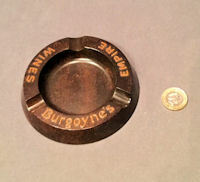 5.75" diameter x 0.75". 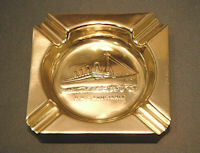 Original, quality, cast brass ashtray in the form of 'Australia' engraved with the states and many towns. 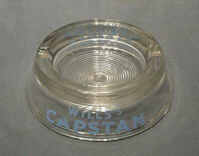 This ashtray is fitted with two cigarette rests to the front and a twin engined aircraft on a stand over the top. The plane is engraved "South Pacific, Sydney Australia 1946". All has been polished and lacquered, although the lacquer may be removed at no extra cost and apart from the propeller blades missing all is complete and in good order. Base map 6.5" x 5" + 1", total 4.5" tall x 6.5" x 6" front to back. Original, quality 1920's, brass revolving ashtray, as fitted to the back of cinema seats. This has two screw holes for mounting, a match striker to the front and has been polished and lacquered, although the lacquer may be removed at no extra cost. The dish can be turned over to empty the contents. Complete and in good and working order. 5" widest including fixing plates x 1.25" high + 1.5" front to back. Price is for each. 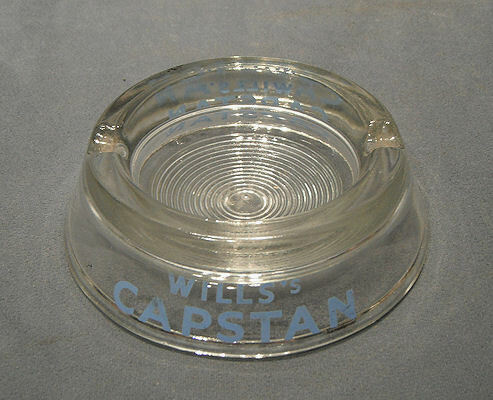 Original, quality 1940's, circular pressed glass ashtray, with blue print to the two sides advertsing "Wills's Capstan" brand of cigarettes. Complete and in good order. 5" base diameter + 1.5 tall. Original, quality, pre-war, square shaped, sheet copper ashtray. Impressed "Richmond Hill Hotel" and "Richmond 2247/8/9" for the telephone numbers. 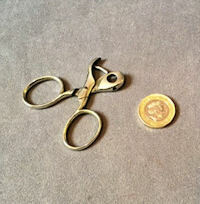 An unusual item, complete and in good and working order. 4.75" square x 0.75" deep. 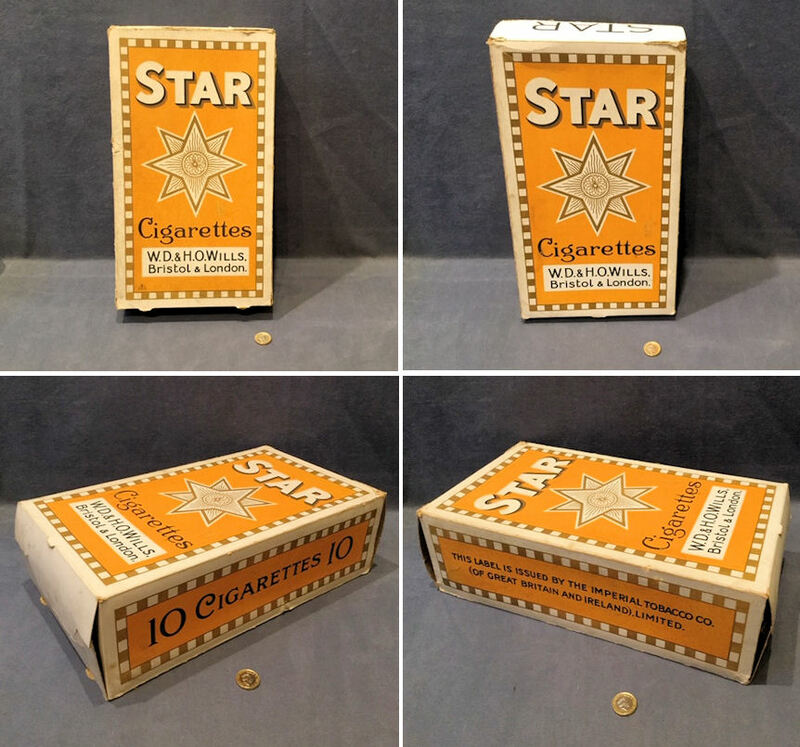 Original, quality pre-war rectangular shaped cigarette box fashioned from "Silver Grey Beech taken from the original piles under the old Waterloo Bridge after 100 years in the river bed". An ivorine plaque with the same information is fixed to the inside of the lid. One minor chip to the front top edge. Otherwise all is complete and in good and working order. 7.25" x 4" x 2.75". Original, quality 1920's steel cigar piercer with a scissor action to pierce the side of the end of a pointed shaped cigar. Complete and in good and working order. 2.5" x 1.75". 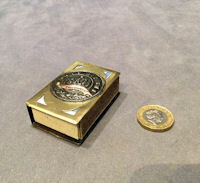 Original, quality First World War trench art brass matchbox cover to take a standard box of matches. The spine is embossed "Souvenir De France" and the front with a German badge and a French banner detailing "SRS France". Polished and lacquered, although the lacquer may be removed at no extra cost and complete and in good order. 2.25" x 1.5" x 0.75". 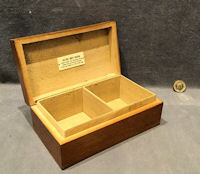 Original, quality pre-war celluloid covered tin match box holder. The spine is detailed "Royal Air Force" and "British Made" and the covers each have a gold coloured "RAF" wings with a Royal Crown over and "RAF" beneath in upper case. 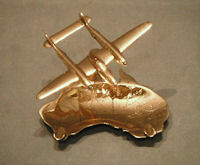 This design is just as the gold Sweetheart Brooch. Complete and in good order. 2.25" x 1.5" x 0.75". Original, quality late 19th century white on blue jasper ware matchstriker manufactured by Wedgwood and impressed as such to the underside. This mint condition example appears to be unused and must have been stored in a cupboard for years for not a mark, or a chip is to be seen. Complete and in good and working order. 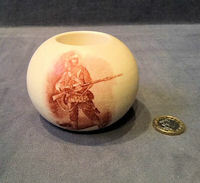 3.5" tall and 5.25" diam. 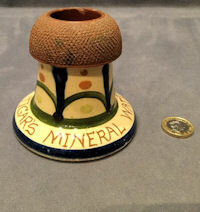 Original, quality 1920's decorated and glazed stoneware matchstriker with a colourful decoration to the lower half and a top section for striking the matches. The body is detailed for "R.E. Tigar's Mineral Water". One chip to the lower rim and other minor chips to the top match section, otherwise complete and in good and working order. 3.5" tall and 3.75" base. 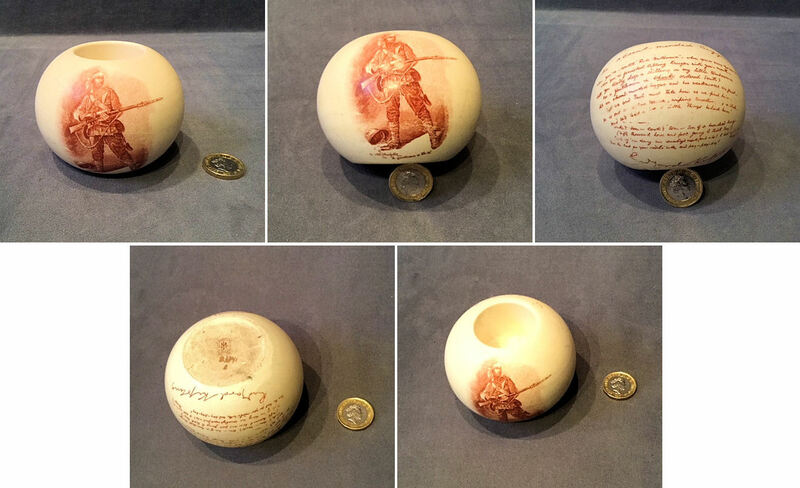 Original, quality late 19th century spherical shaped ceramic match holder / striker with a sepia cameo picture of a Boar War Soldier inscribed "A Gentleman in Khaki" to the front and a poem signed Rudyard Kipling entitled "The Absent Minded Beggar" to the reverse. The underside is detailed for the manufacturer "Maclntyre Burslem England". Complete and in good order. 3" tall x 4" diam. Original, quality 1920's brass match holder on a circular stand, impressed with the sun logo and "WT&S" for the manufacturer 'William Tonks & Son of Birmingham' to the underside. 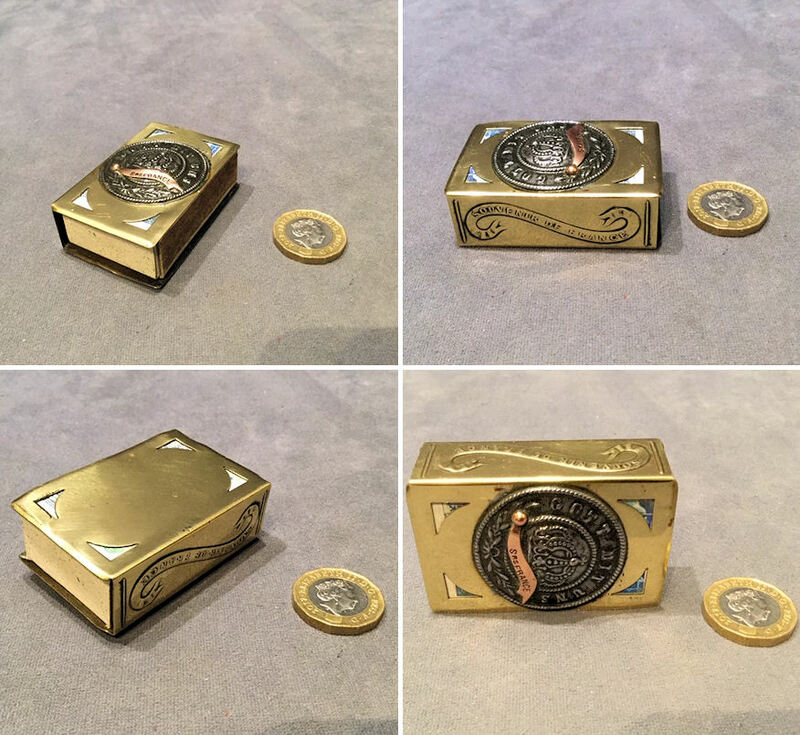 This example will hold a small box of matches to the top and the saucer base is for the spent matches. 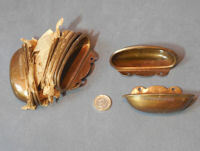 Some remains of the original lacquer to the underside and now all polished and lacquered, although the lacquer may be removed at no extra cost. Complete and in good and working order. 3.75" tall excluding match box and 4.75" base diam. Price is for each. Original, quality 1920's spherical shaped clear glass match striker with cut glass vertical decoration over the fine ribbing and a hallmarked silver rim. Good wear to the underside, some very minor scuffs to the silver and complete and in good and working order. 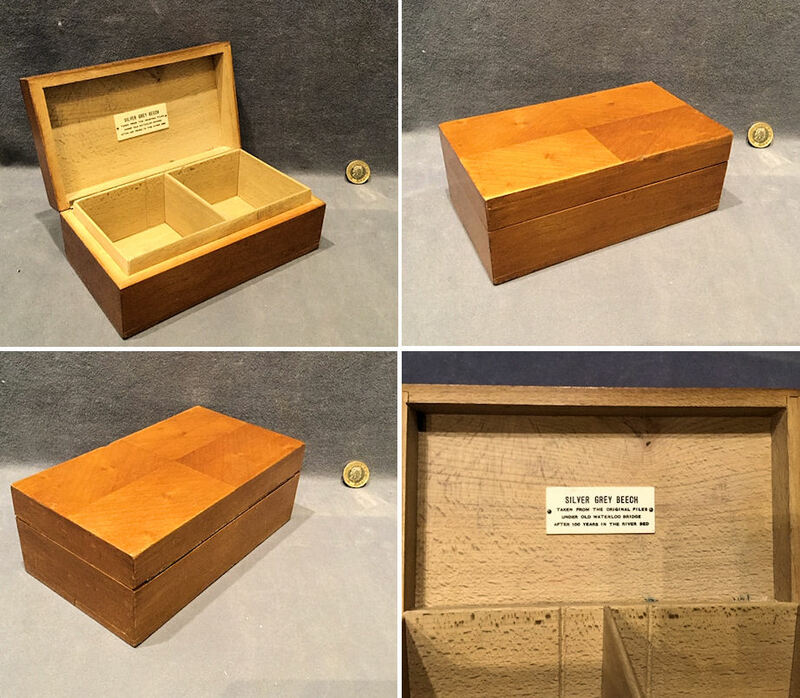 These were used to hold matches in on the table or bar, and the fine ribbing was the striking part. 2" tall and 2.25" widest. 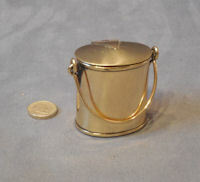 Original, quality late 19th century brass match holder and striker fashioned as a miniature dairy can. 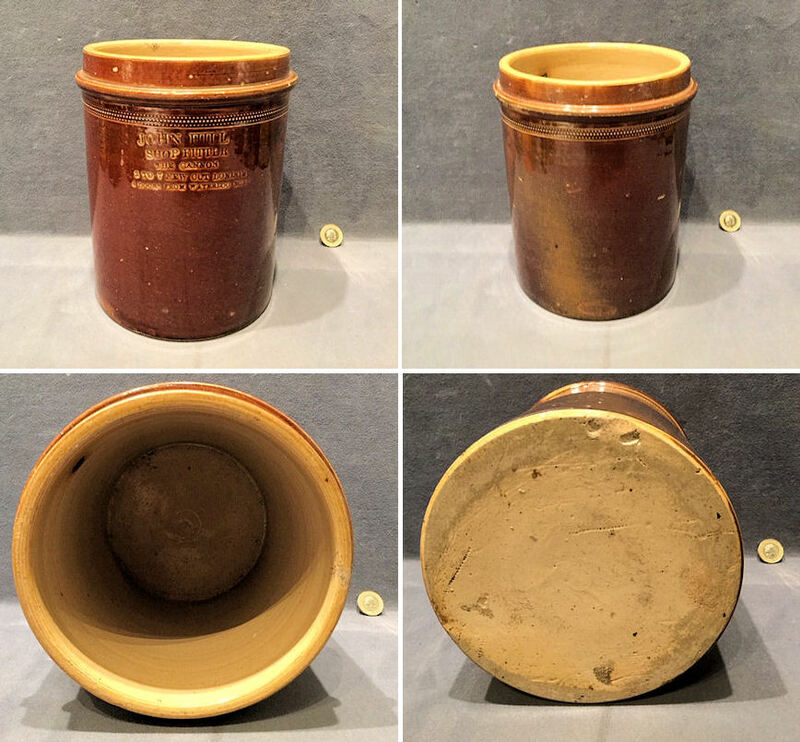 This perfectly scaled down example has the loop handle to the top just as a standard dairy can but with a circular dished interior for the matches and a ribbed underside for striking red tipped matches. All has been polished and lacquered, although the lacquer may be removed at no extra cost and complete and in good and working order. 2.25" tall with handle down. 2.5" wide and 1.75" front to back. Original, quality 1920's, square shaped, pressed brass ashtray with four corner cigarette rests and an embossed detail to the centre of a liner with four funnels and "RMS Aquitania". Polished and lacquered, complete and in good order. 3.75" square x 0.5" tall. 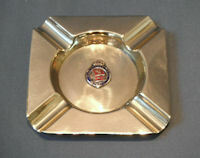 Original, quality 1920's / 30's, brass ashtray with an enamelled crest to the centre for "RMS Queen Mary". 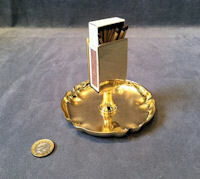 This square ashtray has a cigarette groove to each corner and was originally nickel plated, most of which is still visible to the underside. Polished and lacquered, although the lacquer may be removed at no extra cost and complete and in good order. 4.75" x 4.5" and 0.5". 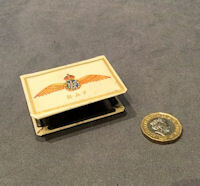 Original, quality 1930's, brass ashtray with a matchbox holder to the centre, all trench art worked from brass with punch engraved decoration to the base and 'RAF' and 'ADEN' to the sides of the match holder. Polished, lacquered and complete and in good order. 4.5" x 3" high. 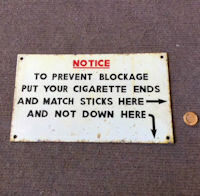 Original, quality post-war instructional sign printed on white painted sheet steel detailing "To prevent blockage put your cigarette ends and matchsticks here -> and not down here ->. This example has four screw holes for mounting and is generally in good order and complete. 11" x 6.5". Original, quality 1920's double sided very clean rectangular shaped enamel advertising sign with a mounting flange to one end. This colourful example is detailed "Swan Vestas the smoker's match, British made by Bryant and May" to both sides. The mounting flange has four screw holes and both sides of the sign has some damage to the enamel but only minor, otherwise all is complete and in good order. 18" x 12" and 1.5" flange. Original, quality 1920's, enamel advertising sign detailing "Ogden's St Julien Tobacco" in white upper cased text on a wood grain effect background. A clean, bright sign with some edge chips and some minor surface scratches, otherwise complete and in good order, with four screw holes for mounting. 66.5" x 21". 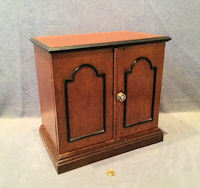 Original, quality 1920's / 30's smoker's cabinet with the appearance of a miniature two door safe. The pair of oak doors open to reveal three drawers in fruitwood and a double rack capable of holding eight pipes. 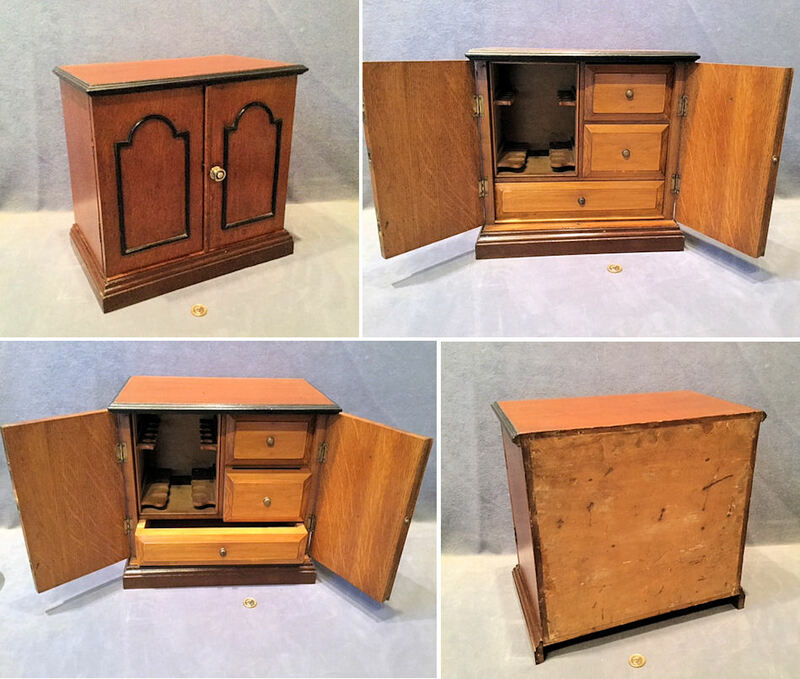 A useful collector's cabinet in the original finish and in super condition. 12.75" tall x 13.5" and 8.5" front to back. 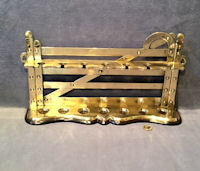 Original, quality 1920's brass vesta case in the form of a domino. The base slides out to access the matches and the drawer end has the striking plate. All has been polished and lacquered and is complete and in good and working order. 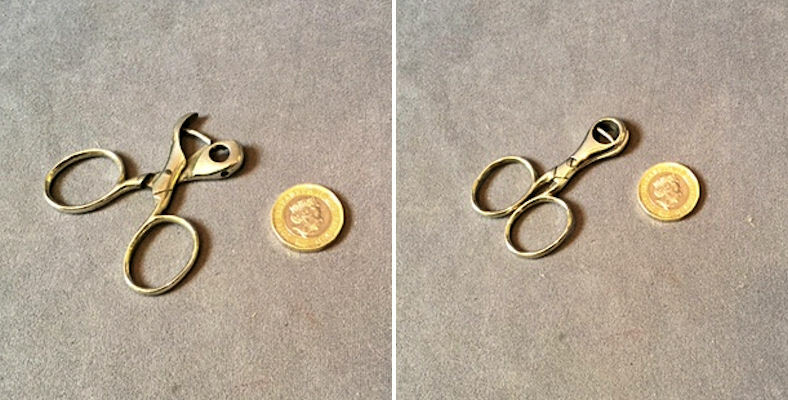 1.75" x 1" 0.5". Original, quality bronze vesta case manufacturer for Huntley and Palmers circa 1890, by Schutz of Vienna, as a promotional item. This is in the form of the Huntley and Palmers 'Albert' biscuit and was originally covered in biscuit coloured paint. 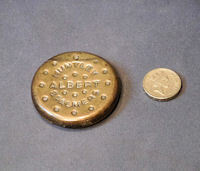 Impressed to the front, as in the biscuit 'Huntley and Palmers Albert' and to the reverse "Made in Vienna". Complete and in good and working order. 2" diam x 0.25".